Cooking in Hebrew enables pleasant, relaxed meeting of community members to deepen content of Jewish identity, holidays, and festivals. On the weekend, members of the Los Angeles Jewish community held their first Tu B'Shvat seder as part of the Cooking in Hebrew project. A unique program of the World Zionist Organization Department for Diaspora Activities. 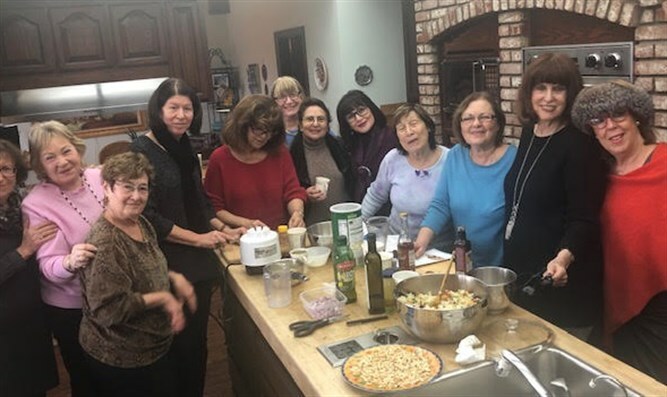 Members of the community cooked delicacies with the fruits of the holiday and organized a Tu B'Shvat seder together with songs of the Land of Israel and an in-depth study of the spirit of the holiday and Jewish identity. The program combines the world of taste with the spiritual world, and enables an in-depth discussion of issues related to Jewish identity, Jewish holidays, and Israeli holidays, combined with recipes with Israeli flavor. Community members cooked traditional Jewish dishes in the spirit of the holiday, together with learning Hebrew and performing the seder with holiday song. The purpose of Cooking in Hebrew is to enable a pleasant and relaxed meeting of community members where they deepen their content of Jewish identity, holidays, and festivals. During the meetings family memories are told an they learn to prepare Jewish and Israeli dishes that are connected to Jewish heritage, and of course they learn Hebrew (in a program mainly intended for English speakers). The meeting enables less predictable and less connected audiences to reach and connect. Today there are more than 30 Hebrew and English speaking groups in the United States and abroad (some of them are offered to the Israeli public and some are offered to the local Jewish audience - some attendees are non-Jewish but very much want to learn about Jewish and Israeli culture). There are several other Hebrew speaking groups outside of the United States, in Poland, Hungary, France, Belgium, Germany, England, Uruguay, Argentina, and South Africa.